Blaze of Glory, published by Marvel Comics, 4-issue miniseries, original cover price $2.99. Well-done western fare is hard to come by in the world of comics, but not impossible. 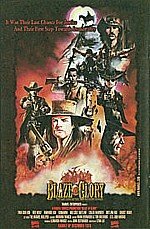 Take Marvel’s Blaze of Glory miniseries published in 2000. Written by well-known comics scribe John Ostrander, with artwork by uber-talented Leonardo Manco, it may not be the comic book equivalent of “Lonesome Dove,” but it’s well worth rifling through the bargain boxes. Blaze is a re-visiting of many (all?) of Marvel’s western heroes. Thankfully, however, this story can be enjoyed by even the newest of fans without the need for prior knowledge of the characters. The first issue does a good job of telling readers who’s who, and even includes short bios and origins. The story concerns the town of Wonderment and it’s inhabitants, “ex-slaves and poor whites,” who have built successful lives for themselves. Of course, someone wants to take it all away. And, with the help of a ruthless and bloodthirsty band of white-hooded men called the Nightriders, that someone is close to doing so. The cry goes out, however, to the heroes of The West, and the battle is joined. Ostrander does a good job with characterization, making the players far more interesting than any of their early incarnations (‘40's through the ‘60's), and providing the most colorful chemistry between our heroes. It has been said, however, that heroes are made more intriguing by having fascinating villains. If true, then the story is somewhat lacking, as the primary villain, as well as his henchmen, are fairly ordinary. Stealing the show, however, is Manco’s art, with a color assist from Mariana Manco. Securely based in realism, with an amazing attention to detail, this highly evocative style can be habit-forming. It’s one of the reasons why Manco is one of my all-time favorite artists in the industry. Blaze of Glory is recommended for readers who enjoy westerns, or just like beautifully-drawn stories. Find it at comics shops or online retailers and auctions. Interested in the exciting Oklahoma Cartoonists Collection and Toy and Action Figure Museum? Go to fourcolorcommentary.blogspot.com & www.youtube.com/watch?v=eCARtM5BvvU.